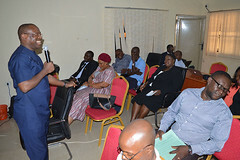 The Chief Job Creation Officer, Prof Eric Eboh, gave the charge during a Stakeholder Roundtable for realizing the job creation targets for the cassava value chain under the SMART Agenda held in his office. The interactive roundtable put together by the Office of the Chief Job Creation Officer in collaboration with the Ministry of Agriculture and Natural Resources, Ministry of Commerce and Industry and Ministry of Economic Planning had participants from representatives of cassava farmers and processors, cassava industrialists, private sector investors and representatives of developing partners. Prof Eboh gave the estimate of cassava production in the State as 1.7 - 1.9 million metric tons in a cultivated area of about 135,000 – 150,000 hectares, giving an average yield rate per hectare as 13.5 -15 metric tons per hectare which is below the approximately 25 metric ton per hectare. He said the 2.5 metric tons Uzere Cassava Processing Factory Limited (UCPFL) in Isoko South Local Government Area has the capacity to create between 20 – 30 jobs and more than 300 indirect jobs if well managed to produce at full capacity, regretting that the processing factory is being marred by poor market linkages, low level farm management and low level of investment in the cassava downstream sector. He disclosed that the Delta State government under the Production and Processing Support Programme (PPSP) has supplied 13,500 bundles of cassava cuttings and 1,800 bags of fertilizers to 450 farmers in the state and a cash support of #45,000 to each beneficiary. 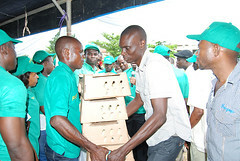 He enumerated ways to move the industry forward which according to him were actionable steps for operationalizing the (UCPFL), measures to organize the cassava producers, workable practices and mechanisms for linking production to target markets and actionable measures to boost cassava production through farm management especially the soil and crop. He urged cassava farmers and processors to organise themselves to share responsibility of any intervention that would be executed in the State. In his brief, the Hon Commissioner for Agriculture and Natural Resources, Mr Austin Chikezie, reiterated Delta State Government’s commitment to boosting cassava industrialization in the state through the establishment of 3 modern cassava processing mills with a capacity of 2 tonnes per day at Ubulu-Okiti in Aniocha South, Oghara in Ethiope West and Ogbe-Ijoh in Warri South West Local Government Areas respectively which are at different stages of completion. In terms of investment opportunities, he said Delta State has over 200,000 hectares communal farm land which could be used for cassava production on a large scale using a private sector driven approach. 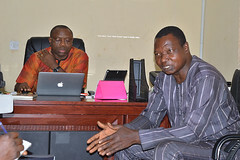 According to him, tractorization of farms through government subsidy support and opening up of farm roads in our rural communities; making available farmland for cassava production by communities; public private partnership (PPP) for cassava production, processing and packaging; provision of affordable and appropriate Mini Cassava Processing Machines for cassava farmers and private sector involvement through partnership in the completion of the on-going Specialized Cassava Processing Centres in the 3 Senatorial Districts of the State would promote the Delta State Government’s goals in realizing its job creation targets in the cassava value chain. 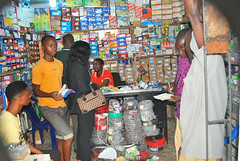 On her part, the Hon Commissioner for Commerce and Industry, Barr. 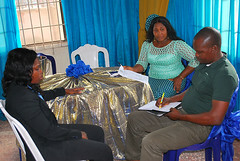 (Mrs) Mary Iyasere revealed that the equity ownership of the (UCPFL) is 80% holding by the Delta State Government and 10% each by the host community, Uzere and Isoko South Local Government Area respectively. She solicited for a private investor who would buy up the 80% equity stake of the State Government in (UCPFL) in order to boost its current state of processing 10 tons daily to an increased capacity of processing 25 tons daily of fresh cassava tubers mainly into starch and garri. 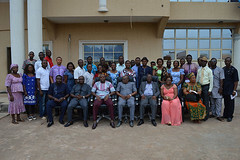 Earlier, the Hon Commissioner for Economic Planning, Dr. Kinsley Emu, stated that Delta State is adjudged one of the major producers of cassava in Nigeria, charging all stakeholders interested in the cassava value chain to work towards being major suppliers of cassava bi-products in Nigeria in particular and in the world at large so as to generate employment and to create wealth. Speaking separately, the representatives of development partners, Mrs Folusho Olaniyan of Market Development for the Niger Delta (MADE) and her counterpart of the same organization, Prof. Lemchi Jones, remarked that their organisation is ready to partner with the State Government in creating market linkages for cassava producers in the state by linking cassava producers with cassava processors.